If left to grow unchecked, the branches on your pine tree can eventually prove a nuisance. This is especially true for low-hanging branches or limbs. Pine branches often hang so low that they make it impossible to comfortably pass beneath with a vehicle. They make it difficult to mow beneath the tree with a riding lawnmower. In certain situations, low pine limbs may also impede or block your view of oncoming traffic. Fortunately, removing these low branches is a reasonably simple task. Remove any debris near the pine tree that may obstruct your workplace. Set up your stepladder near the trunk of the pine tree if you cannot reach the branch from the ground. Make sure the ladder is close enough so that you can reach the branch with your saw but far enough away so that the falling branch does not hit you. Grasp the saw firmly and cut approximately half-way through the pine branch at a distance of roughly 12 inches from the trunk of the pine tree. Cut from the underside of the branch, upward. Move 1 inch down the branch and begin your second cut. Start this cut on the topside of the branch. As you cut through the branch with your saw, the branch will break off between the two cuts. Cutting the branch in this manner will reduce damage to the tree. Cut away the remaining stub of the pine branch. Do not cut the branch all the way back to the trunk but cut so that the branch collar remains intact. The branch collar is the enlarged segment of bark and wood that separates the base of the branch from the trunk of the tree. Hold the saw so that it cuts at an approximate 45-degree angle from the top of the branch during this third cut. 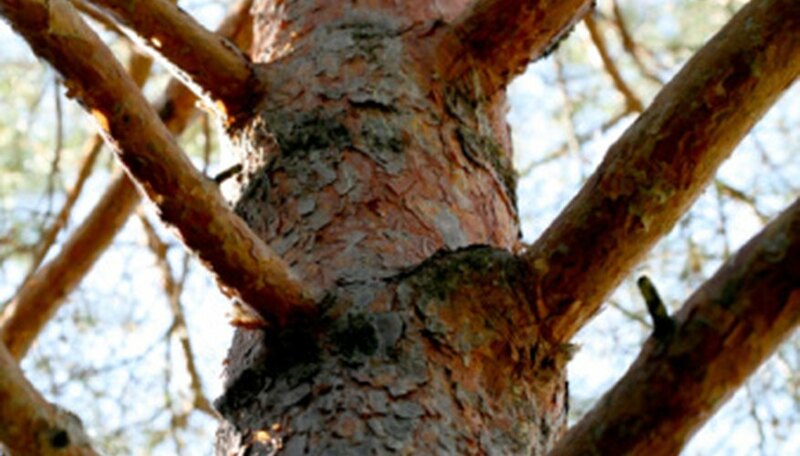 This method will prevent further injury to the pine tree's bark. Repeat the pruning procedure as many times as necessary to remove all of the low-hanging branches on your pine tree. Use gloves and eye protection, such as safety glasses, when using a chainsaw or pruning saw. Avoid removing the pine tree limbs in late summer or fall. Pruning during this time makes the tree more susceptible to damage caused by the upcoming cold of the winter months.